One French actor of African origin and 28 filming shifts, one crazy producer and a hundred people in a crazy team, two wedding loaves and three cakes, a special service squad with machine guns, a priest and a deacon, two wedding dresses, one wig and false moustache for the toast master, one heart attack and Oleg Vynnyk – and the filming of Crazy Wedding comedy feature was completed. The film will go into wide Ukrainian release on October 4. “The filming went by very fast, like a skydiving experience. Agreed teamwork yielded its result, and now I have a gut feeling we have managed it all. On the big screen, the audience is in for a crazily dynamic and funny story, unexpected transformations of well-known Ukrainian actors and show business celebrities and also lots of surprises. However, it is for the viewers to decide whether we have managed everything – starting from October 4 in Ukrainian cinemas,” says film director Vlad Dykyi. The team of MOZGI Entertainment producing centre has made a music video for the first soundtrack to Crazy Wedding – Promin’ (The Ray), dedicating this to the end of filming. The video includes footage from the filming set of teasers and the ceremony of breaking a crazy plate with the participation of film celebrity actors Yuriy Gorbunov, Oleksiy Potapenko (Potap) and MONATIK, and also lead actors Jimmy Voha-Voha, Polina Vasylyna and the film crew headed by director Vlad Dykyi. The lead roles in the film were played by Nazar Zadniprovsky (Vasyl Seredyuk, the bride’s father), French actor Jimmy Voha-Voha (François, the groom), Polina Vasylyna (Katya, the bride), Lesya Samayeva (Galyna, Vasyl’s wife), Oleksandr Kobzar (Taras, Vasyl’s neighbor), Vira Kobzar (Oksana, neighbor’s wife), Inna Prykhodko (Olga, neighbor’s daughter), Aram Arzumanyan (Ashot, neighbor’s son-in-law), and others. Show business celebs also joined the project – e.g., Potap and MONATIK who played Yevlampiy the priest and Pylypon the deacon, crazy producer Yuriy Gorbunov in the role of toast master Nazar Zapukhlyak and Oleg Vynnyk whose role is for now kept secret by the film authors. Just a reminder, the producing center of Oleksiy Potapenko (Potap) and Iryna Gorova MOZGI Entertainment became the film’s co-producer. Hit soundtracks are created exclusively for the project by Potap, film’s music producer. And the first official sountrack to the comedy, Promin, was performed together by MOZGI, Michelle Andrade, and Vremya i steklo. After wide theatrical release the TV premiere of Crazy Wedding will take place on air of 1+1 TV channel. 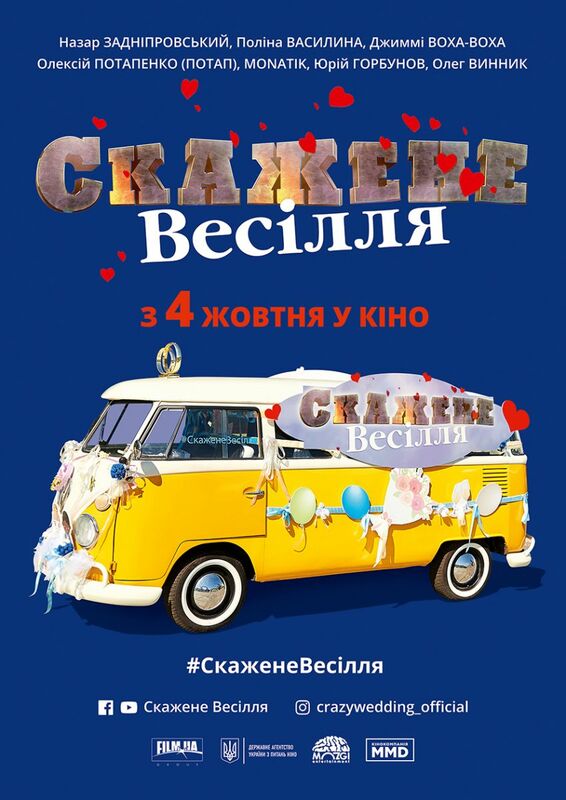 Crazy Wedding comedy became one of the winners of the 10th competitive selection by Ukrainian State Film Agency. The film’s total budget is 10.8 million UAH; out of those, the Agency’s portion amounted to 1.18 million UAH. Before, Prototype Production struck a deal with FILM.UA Group on providing a full package of services on special conditions for production, promotion and distribution of Crazy Wedding in the framework of FILM.UA Group package proposal for projects supported by Ukrainian State Film Agency.